If you’re a leader—or you’re planning to be one—you need to know how to maximize your and your team’s efforts to accomplish your goals. 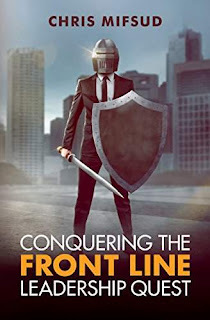 In Conquering the Front Line Leadership Quest, Christopher “Chris” Mifsud teaches you how. A good leader learns, empowers, appreciates, develops, engages, and respects—LEADER. In this guide, Chris dives deeper into these six qualities and shows you how to cultivate them. Whether you’re a business owner, supervisor, manager, or team leader, his leadership solutions will help you grow your business and prosper in today’s economy. Conquering the Front Line Leadership Quest doesn’t bore readers with obscure theories. All the techniques included in the guide are drawn from Chris's twenty-five years of experience as a leader. For realistic, actionable advice you can apply to your organization as well as your life, look no further than this easy-to-understand manual.